25명의 새로운 수퍼 란도너들과 함께 한국 란도너스의 봄 시즌 브레베가 끝나가고 있습니다. 이제 최고의 도전인 “전라 1200”을 위한 시간입니다. 이번 1200K “그랑 란도니” 에서는 전라도의 눈부신 아름다움과 다양한 먹거리들을 즐길 수 있으며 주로 조용한 지방도를 편하게 달리게 됩니다. 라이더들은 6월 6일 먼동이 터올 때 광주를 떠나서 동쪽의 지리산으로 향합니다. 구례 기준점에서 잠시 멈춘 다음에는 섬진강을 따라 남동쪽으로 향하며 아름다운 다리들을 건너 남해군으로 가게 됩니다. 동쪽 해안을 따라 굽이도는 길을 따라가면 은모래 해수욕장으로 유명한 상주의 두 번째 기준점에 닿게 됩니다. 거기서 우리는 북쪽으로 방향을 돌려 광양을 지나고 다시 남쪽으로 돌아서 고흥과 소록도를 거쳐 거금도의 금산으로 향합니다. 그 다음은 많은 분들에게 친숙할 경로를 따라 유명한 율포 기준점을 지나 마량으로 향합니다. 마량에서 다시 출발한 다음에는 해안 도로를 따라 땅끝으로, 그리고 다시 북쪽으로 방향을 돌려 해남과 함평으로 가게 됩니다. 계속 해안을 따라 영광 홍농과 흥덕을 거친 후에는 오랜만에 안쪽 길을 통해 군산까지 가게 됩니다. 군산에서는 북동쪽으로 방향을 돌려 코스 최북단 기준점이 있는 공주에 닿게 됩니다. 다시 남쪽으로 돌아선 다음에는 논산과 진안에서 발길을 멈추게 됩니다. 진안에서 광주의 완주 지점까지는 비교적 편안한 라이딩이 될 것이고 라이더들은 6월 9일 일요일 오후까지 들어와서 월요일 아침이면 일터로 돌아갈 수 있을 겁니다. 마지막으로, 앞선 기술을 애용하는 한국의 란도너들은 GPS 장치나 스마트폰만으로 길찾기를 하기 때문에 이번 대회에는 큐시트가 제공되지 않을 예정입니다. 란도너링의 새로운 시대가 도래했습니다. Now that the Brevet series of Korea Randonneurs has been completed with 25 new “Super Randonneurs”, it is time for the ultimate challenge, the JEOLLA 1200 (Registration). This 1200K “Grand Randonnee” showcases the stunning beauty and spectacular cuisine of Jeolla-do, and all this on mainly quiet country roads that makes cycling easy. Riders will depart Gwangju at the crack of dawn on June 6th and head east towards the Jiri-san. 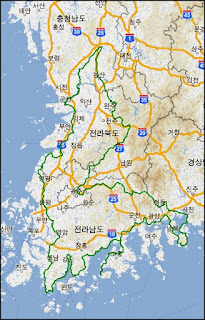 After a quick stop at the control in GURYE we will head southeast along the Somjin River and cross over several beautiful bridges to Namhae-do where we will meander along the east coast before reaching our second control in SANGJU. We then turn north, loop past Gwangyang and head south to Goheung and the island of GEUMSAN. Next is the familiar route along the coast passing our most popular control in YULPO and then on to MARYANG. Leaving Maryang we will follow coastal roads to TTANGKKEUT and then head north to HAENAM and HAMPYEONG. 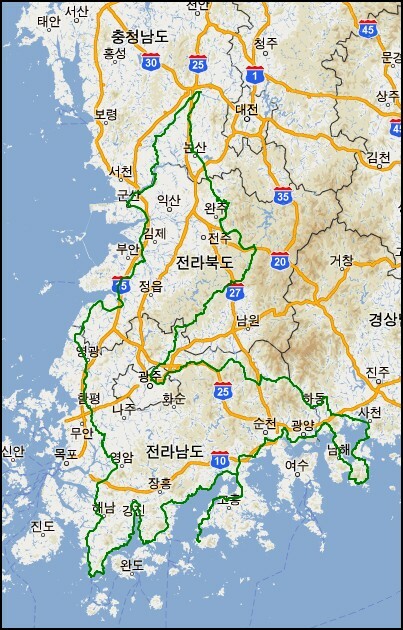 We will then follow the coast to YEONGGWANG and HEUNGDEOK, where we turn inland to reach GUNSAN. From Gunsan we head northeast to reach our northernmost control, GONGJU. Turning south, our next stop is NONSAN and then JINAN. From JINAN it will be smooth riding to our finish in GWANGJU and all riders should be able to return in the afternoon on Sunday, June 9 – and be back at work on Monday morning. Lastly, since Korea Randonneurs are high tech savvy and use only smart phones for navigation, no cue sheets will be provided. A new era of randonneuring has emerged.